From the dawn of civilization, humans have been entranced, influenced and fascinated by the night sky. The sky served as a navigation tool, it had religious significance, and it was used as a source of instruction and warnings. Different cultures around the world each witnessed different phenomena over the centuries and this depended on where they lived. We want to investigate why different cultures, particularly the Inuit of the Northern Hemisphere and the Maori in the Southern Hemisphere, saw different phenomena in their night skies. We decided on this topic because of the cultural significance the night sky had on these societies. The Inuit are a unique group in the northernmost regions of the Northern Hemisphere. The Maori inhabit a much different environment, mainly in New Zealand and are in the opposite hemisphere. We also wanted to explain to the general public why the night sky looks so different in different parts of the world. Figure 2. The beautiful Milky Way appears differently than in the Northern Hemisphere. 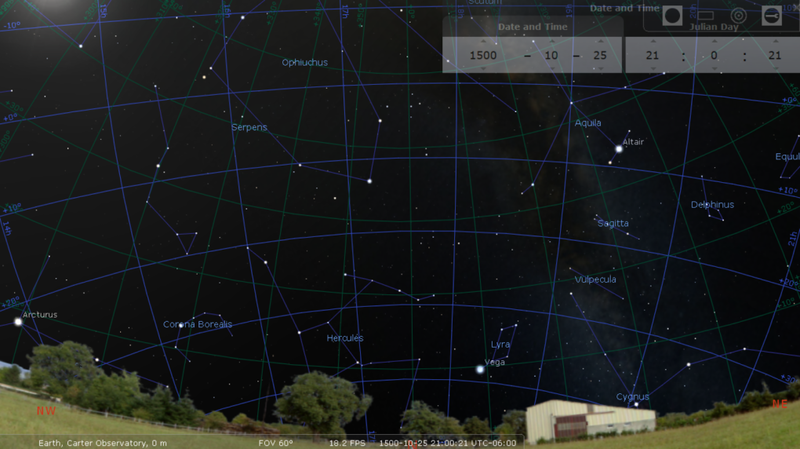 Images captured using Stellarium. Figure 3. A diagram of the night sky as seen from Iqaluit. As the Inuit are in the far north, they would see many stars close to the North Celestial Pole (NCP).2 The NCP is projected onto the celestial sphere above the geographic North Pole and is +90 degrees declination.2 An observer can determine what stars they can see based on their latitude. 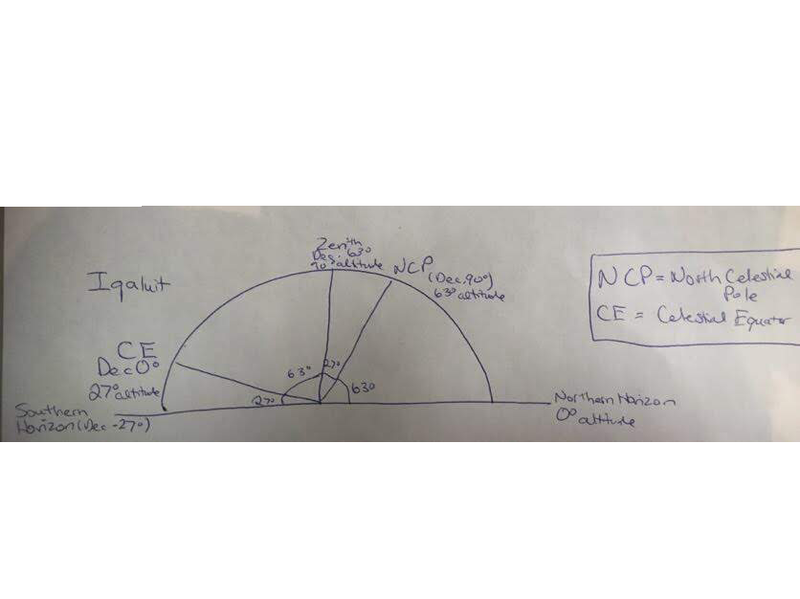 For example, Iqaluit is at 63 degrees latitude, meaning that the NCP is 63 degrees above Iqaluit's northern horizon.4 Any star that is within 63 degrees of the NCP is circumpolar, to 54 degrees above the southern horizon (90 - 63 = 27 and 27 x 2 = 54). This means an observer in Iqaluit would see many circumpolar constellations.2 Anything below 63 degrees to 54 degrees above the southern horizon would be a seasonal constellation. Stars that are below -27 degrees declination cannot be seen by people in Iqaluit. At the NCP, stars that are in the Northern Hemisphere never set. The following diagram shows an example of the night sky seen in Iqaluit. The Maroi people, who are primarily in New Zealand, would see a very different sky. Many of their constellations would be seasonal, due to their location to the South Celestial Pole (SCP).2 The South Celestial Pole (SCP) would be projected onto the celestial sphere above the geographic South Pole and is -90 degrees declination. We determine which stars we can see in the Southern Hemisphere by using the same calculations mentioned before. 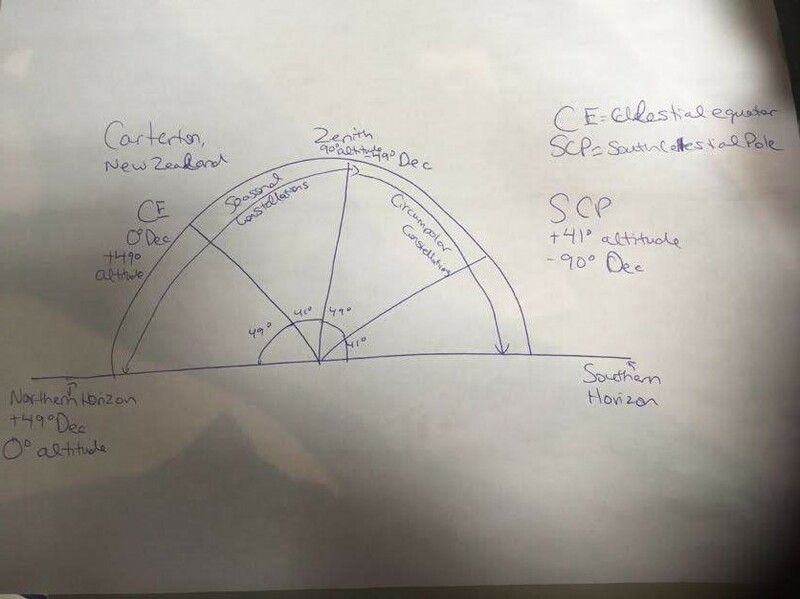 Carterton, NZ is -41 degrees south, and our zenith is directly overhead, it has an altitude of 41 degrees.6 The SCP is therefore -49 degrees south. The seasonal constellations for Carterton would be visible between the northern horizon, till 82 degrees above the southern horizon (anything within a radius of 41 is circumpolar so 41+41=82). An observer in Caterton would have their zenith pointing at a seasonal constellation, as they would be at -41 degrees. Carterton’s night sky would have different circumpolar constellations and more seasonal constellations, because the observer would be at a position to see a greater expanse of sky with seasonal constellations. Anything in the sky below -49 degrees would not be seen by an observer in Carterton. At the SCP, stars that are in the Southern Hemisphere never set. The following diagram explains further the sky seen. Figure 4. Diagram illustrating the night sky in Carterton, New Zealand. To further illustrate this, we used the program Stellarium to compare and contrast the constellations seen by the Inuit and Maori on two different days in the year. Figure 5. Constellations as seen from Iqaluit. 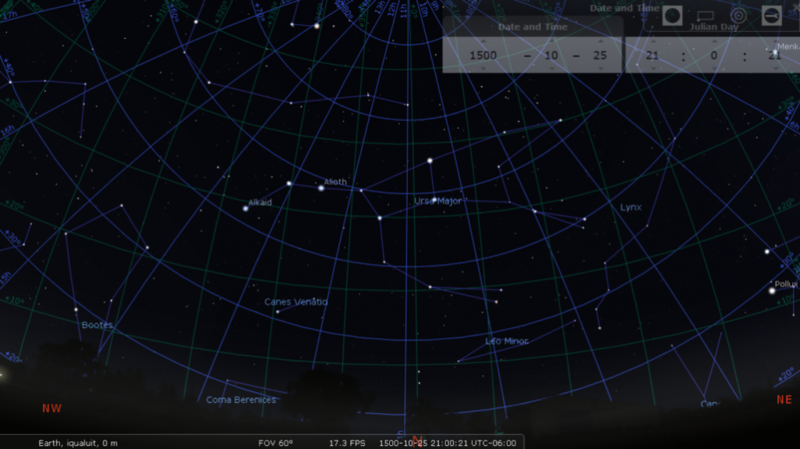 Images captured from Stellarium. Figure 6. More constellations as seen from Iqaluit. 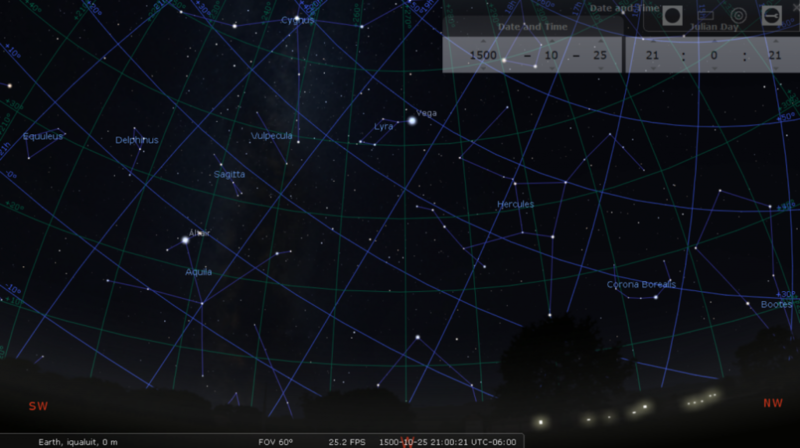 Images captured from Stellarium. Figure 7. The constellation Ursa Major, which in Inuit is called Tukturjuit (plual) or Tukturjuk (singular). 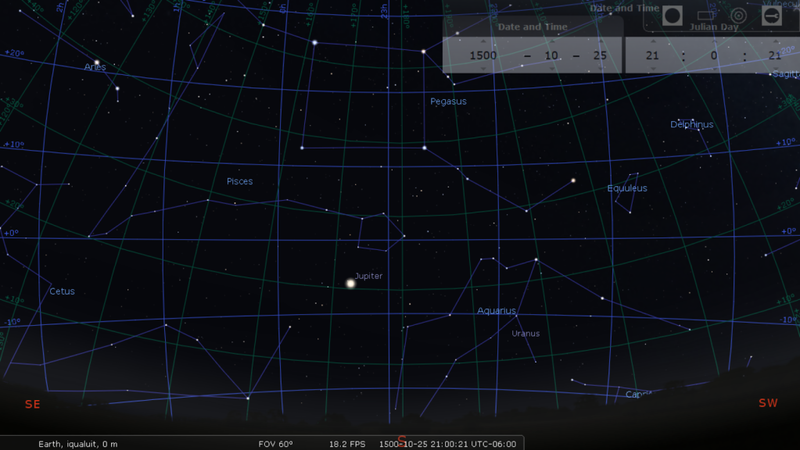 Images captured using Stellarium. Figure 8. Constellations as seen from Caterton, New Zealand. 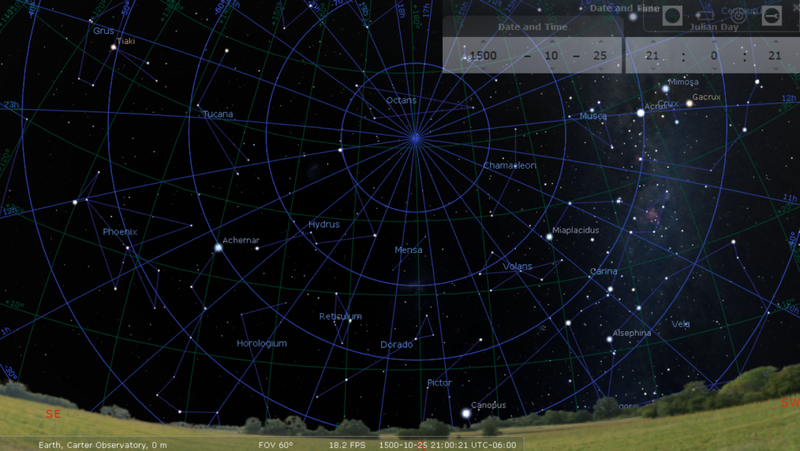 Images captured using Stellarium. Figure 9. More Constellations as seen from Caterton, New Zealand. 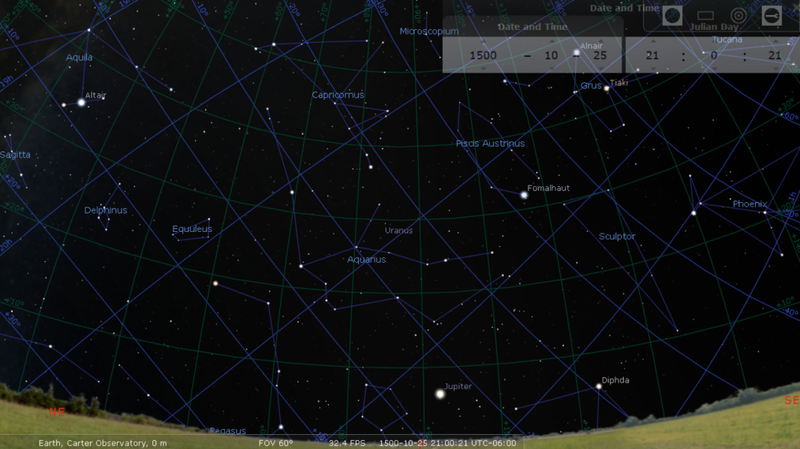 Images captured using Stellarium. Figure 10. Further illustration of the constellations as seen from Caterton, New Zealand. 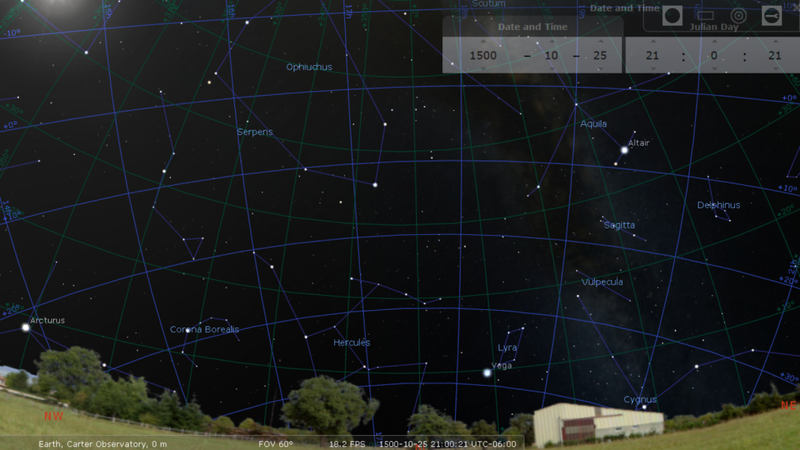 Images captured using Stellarium. Figure 11. 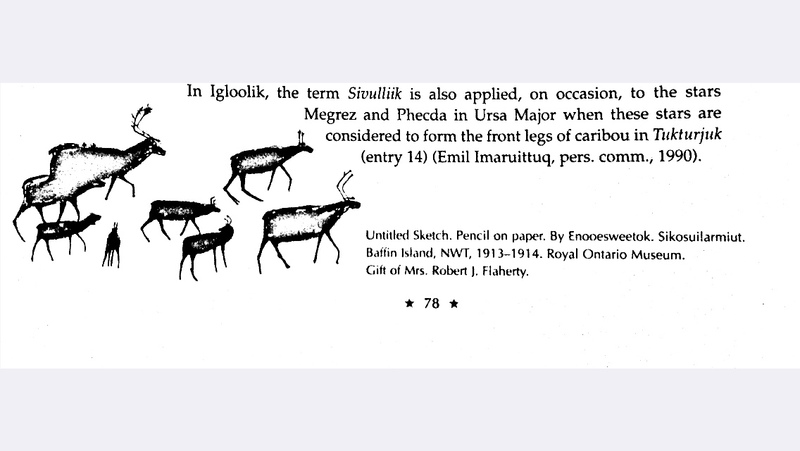 Photo: a drawing of a the constellation Ursa Major as a herd of caribou. J. MacDonald, The Arctic Sky: Inuit Astronomy, star lore, and legend. (Nunavut Research Institute, Canada: Friesen Printers, 2000. p.78. The stars provided both cultures with markings for time – one to signify the return of the sun, the other to signify the dawn of a new year. While the Inuit used the constellation Ursa Major to estimate the passage of time during the periods of extended darkness. 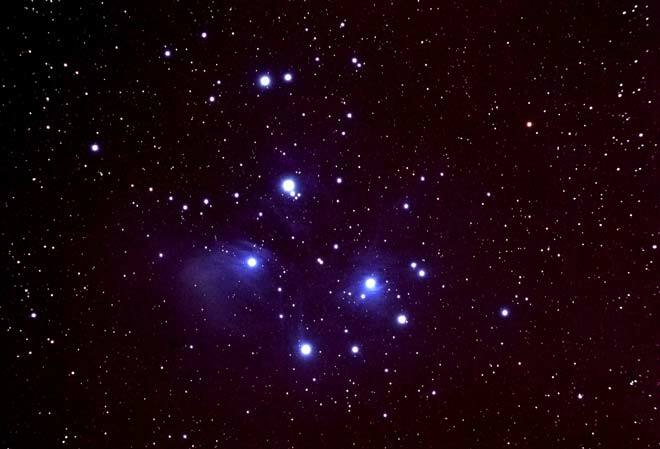 During dawn the constellation will appear upside down and will reverse back upright during the evening whereas the Maori had no use for this constellation because they never witnessed it in their night sky. 9 With a greater understanding of why we see the stars we see at the time we see them, we can understand better how these cultures developed and used the sky to their advantage. The night sky has fascinated, guided, and inspired people since the dawn of time and each culture’s own interpretation of it has influenced their beliefs and ways of life. The science behind why different stars were seen by the Inuit of Northern Canada and the Maori of New Zealand is because of the revolution of the Earth around the sun and their position on the globe. 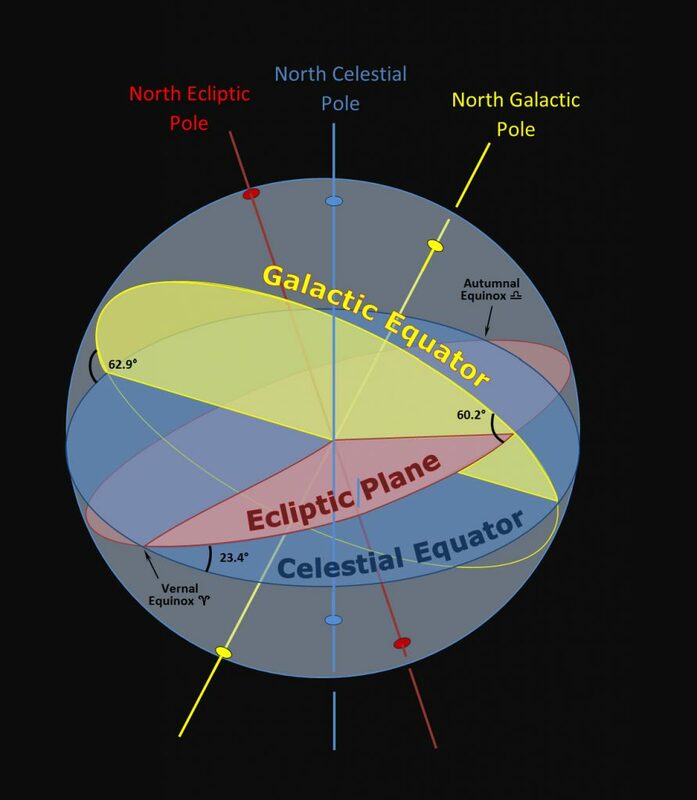 How we determine which stars we see is through our latitude on the globe and the azimuth. The specific stars and constellations that each culture witnessed have lead not only to their societies being formed, but others as well, since the dawn of time. Our night sky has inspired humanity and continues to do so. J. MacDonald, The Arctic Sky: Inuit Astronomy, star lore, and legend. (Nunavut Research Institute, Canada: Friesen Printers, 2000), p.78.